Getting (and staying) fully invested. Challenge Accepted: My 100 day project. I'm in Boston now visiting friends and sketching whenever I have a moment free. 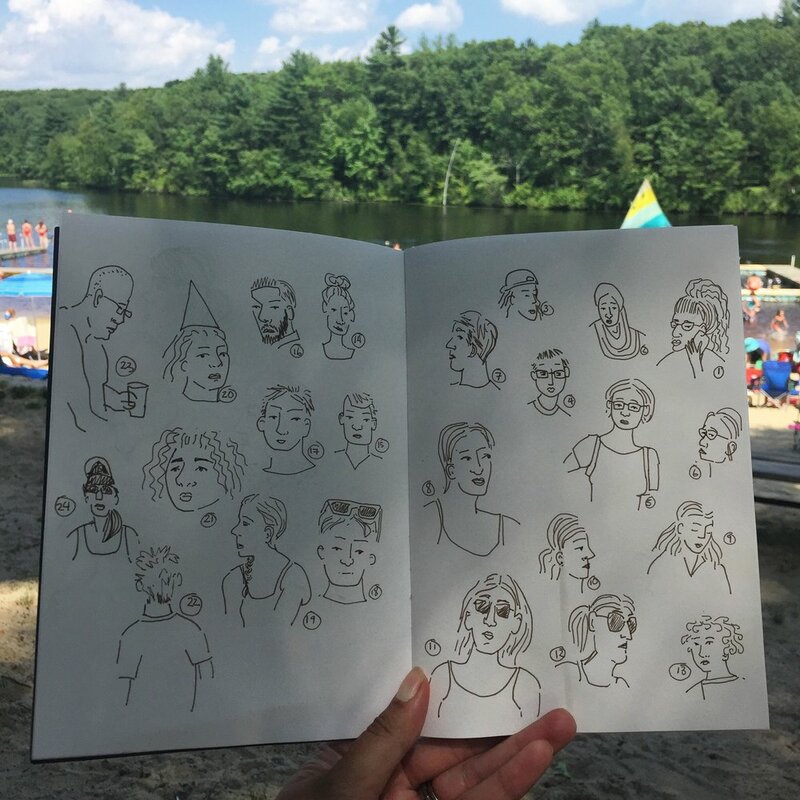 Yesterday I did some people watching on the beach and sketched them while my kids swam. It was great. But mostly I'm just spending time with friends here. But in a few days we will be heading to Chicago and in a week I will be surrounded by Sketchers and sketching nonstop. I'm so excited. Who else is going? I packed rather light and everything but my sketchbooks fit in a small bag. I'm interested to hear what others are bringing. Sketching people at the beach. Sketching the Boston south end with the local Urban Sketching group. Over on Instagram I am hosting a contest to win a postcard that I sketched in Lisbon. Comment here with a place you would love to visit for a chance to win and head over to Instagram for a second chance to win. I will pick a winner June 8th. One of my favorite times of the month is when I get to spend the day in London sketching with the Urban Sketching/ USK gang there. It's so worth the journey from Oxford. I am looking forward to returning in June and July! Head over to my Instagram for another original art postcard giveaway. Details on how to enter can be found there. 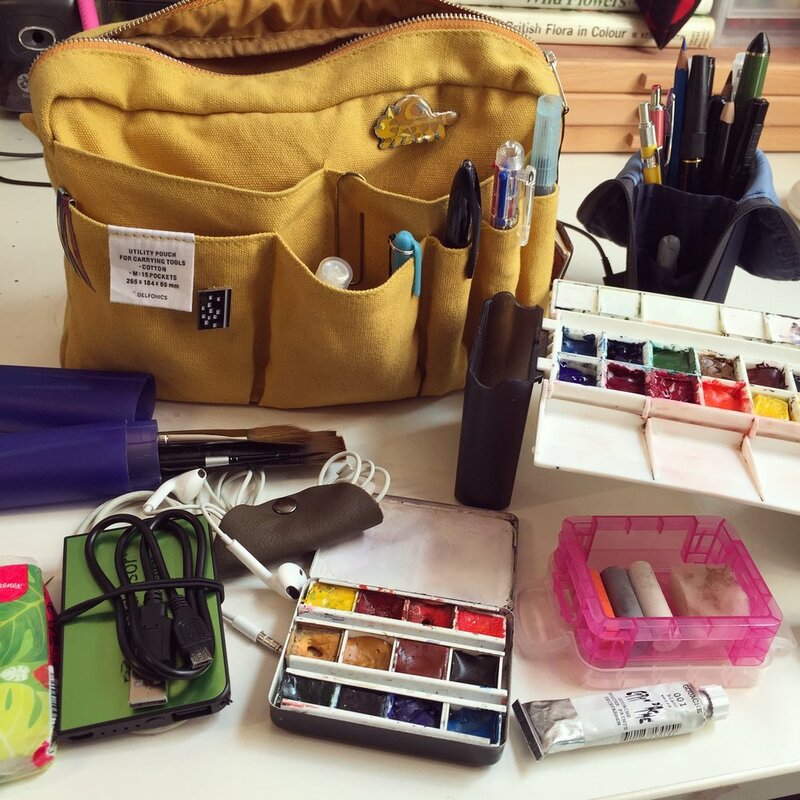 I am in Athens Greece with my paint kit always by my side! I've been sketching my way though this city and my family has been super tolerant of me slowing them down or disappearing for periods of time as a result. An artist must create, especially in a place like this. It is term break here in the UK and my kids are home from school for two weeks. We enjoyed having their father around and abundant sunshine on Friday and going into London over the long weekend. Today he wS back to work and I took us to the local Oxford University Botanic Garden and the three of us sketched there for hours. So far so great with my creative nature loving kids. They never even asked to turn the TV on. How do I want to spend the next year of my life? Do I want to spend it being afraid taking timid steps? No I do not! Today is my birthday and this morning I asked myself what I wanted to do with my day and this is the answer I received. And this time I listened to it and was rewarded for my willingness to push past the fear, play and experiment. And hopefully holding onto it for a bit. Hard with my kids home from school all week making studio time scarce. But things are clicking for me right now. Follow my Instagram account and win a free watercolor postcards. Details on Instagram. So glad that I made it over to London via the x90 bus to sketch Trafalgar Square with the USK London group. 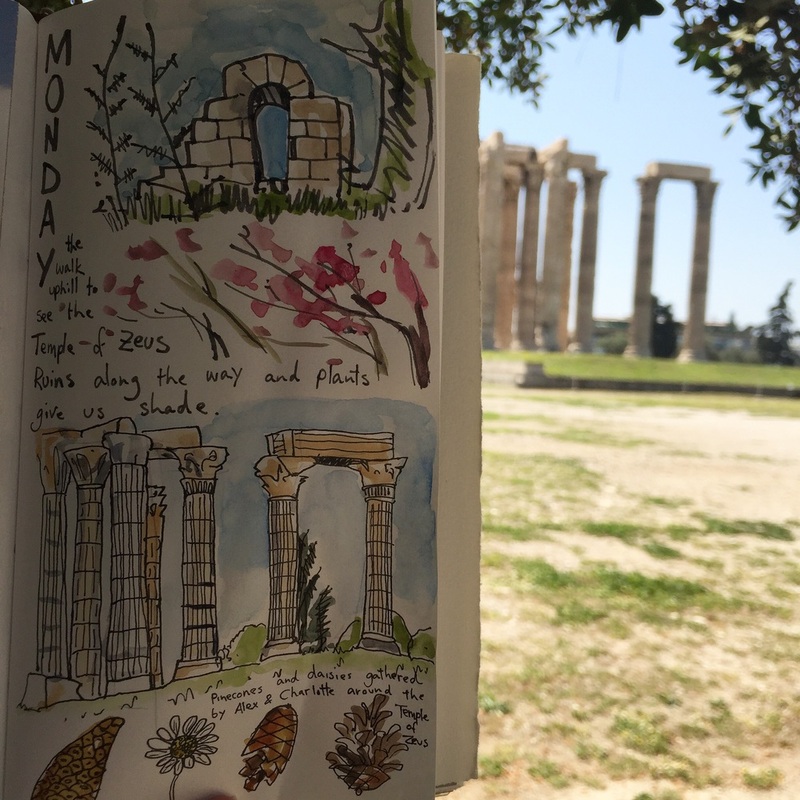 Summer has meant less time for art and significantly less urban sketching time and the hours spent drawing was just what I needed halfway through school vacation. Summer in England. My first Pimm's was at a pub along the river with my sketching buddy. Not a bad way to welcome summertime! Later we wandered a bit more and I got in a quick value sketch of an old church. I have been debating this idea for awhile now but I have decided to go for a daily ink challenge for 2015. I am still working out the details but I think the big things are that every day I need to make something with ink in 30 minutes or less. The #inktober challenge started off slow and difficult but midway through I hit a groove and ended up learning and growing through the challenge and missing it when it was over. My biggest artistic goal for 2015 is to improve my drawing skills and this should do the trick nicely. A year of daily ink is likely to be even more challenging than a month, but hopefully even more rewarding as well! I am excited to start and keeping it up during our travels should be interesting. Moving across the ocean in two weeks is stressful and distracting. Who knew? I am going to miss our friends in Boston so much but at this point I just want to get it over with and get over there already. We have one more full week in our home then the movers come and pack us up and we spend part of a week in temporary housing in Boston. Then we fly out on a Friday red eye flight. The girls are due to start their new school in the UK that following Monday. Some art supplies will come with me on the airplane. Some will go on the small air shipment but most of it will go on a boat and take a month or longer to get to us along with all of our furniture. I need to choose wisely. Temporary housing is waiting for us over in the UK. We will be fine. My goal is to keep working, prepare to depart and enjoy our friends here while we still have them. Life is a party at the moment. I love my Lamy Safari fountain pen. An awesome fountain pen for under $30? Sign me up. Not quite under $30 when you take into account that all pens come with blue ink and you need to buy a converter to use bottled ink but an awesome pen for around $30. It is my main pen these days. I love it for drawing and for writing. Comfortable to use with my left hand and no problem with smearing. I loved it so much that I picked up a Lamy Joy and replaced the very nice calligraphy nib with an EF nib for drawing and that has become my favorite studio pen. The Safari travels around with me and the Joy is always available to me in my studio. Of course the right ink is just as important as the right pen. Pentel Pocket Brush Pen. I have had a couple of Sakura, Copic and other felt tipped brush pens and I hated every single one of them. The tip was never very flexible and wore out super quickly too. Junk. So I ignored recommendations on this pen brush hybrid for ages until I learned that the brush has actual individual fibers like a real brush. Very similar to the waterbrushes I use for painting on the go except instead of water it houses waterproof fast drying black ink. Last weekend I used a coupon to pick one up at a reasonable price and I am so glad that I did. The tip is soft and flexible yet very durable and refillable. As a bonus the ink dries super fast and this lefty doesn't have to worry about smearing or a black stained side of my hand. So far the only downside I can find is that I used up an ink cartridge in less than a week and refills are rather expensive. I tried to refill the empty cartridge with bottled ink and an eye dropper and I ended up with black ink all over my hands instead of in the cartridge. It is very different from any other pen I have ever used and takes a delicate and sure touch that I am still getting used to with practice. I ordered a package of ink refills. Left is a fountain pen, right is the brush pen. Happy Monday. Had a fabulous busy sunny weekend here filled with lots of drawing in my sketchbooks. I am like Benny the Spaceman in the Lego movie except instead of Spaceships I am crazy about sketchbooks. Maybe that is why I love him so much. Or because I remember having a space themed Lego set in the 80's that I loved. We all have our obsessions and sketchbooks and paper are a big one for me.